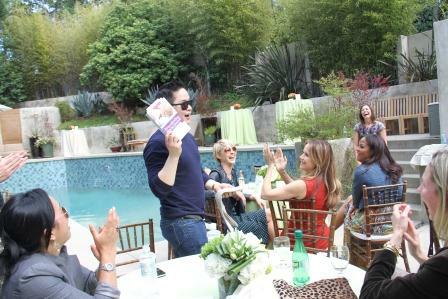 On April 14, Breastfeeding Made Simple was featured at the star-studded celebrity event held at the home of actress Jenna Elfman, star of TV's Dharma & Greg. Actress Kelly Preston, married to A-lister John Travolta, and Laila Ali, former boxer and daughter of Muhammad Ali, partnered with Elfman to host this event. Its purpose was to raise awareness for the not-for-profit organizations Best for Babes and (L to R) Bettina Forbes (Best for Babes), Jenna Elfman, Kelly Preston, Danielle Rigg (Best for Babes), Laila Ali. Photo courtesy of Best for Babes.Healthy Child Healthy World. Best for Babes’ purpose is to "give breastfeeding a makeover" and inspire and educate millions of moms on how to navigate the “booby traps” so rampant in our culture, so they can achieve their personal breastfeeding goals. Jenna Elfman hand-selected Breastfeeding Made Simple as one of her favorite products. In an earlier interview with Best for Babes, Elfman shared that Breastfeeding Made Simple was instrumental helping her meet her breastfeeding goals with her second child, Easton. She spent ten-and-a-half months pumping and bottle-feeding her first child, Story, who never made the transition to the breast. Elfman recommended Breastfeeding Made Simple as one of her top three Photo courtesy of Jessica Pettyjohnbreastfeeding preparation tips. The stack of Breastfeeding Made Simples in the photo on the right was taken in the "nursing lounge" in Elfman's master bedroom. “I am still breastfeeding Benjamin and it has been incredibly rewarding and healing. It gives me so much joy to breastfeed him and I am so grateful that I am able to do it. He loves it too! Mother’s milk is loaded with so much vital protection that your child will never get anywhere else. I know that not all moms can breastfeed but anyone who wants to do it should get educated, be able to make an informed decision about what is best for themselves and their babies, and get all the support they need. Laila Ali admitted that although she was normally a very private person, when it came to breastfeeding, she didn’t care what anyone thought—if her baby was hungry she was going to nurse. Celebrity guests included a pregnant Vanessa Lachey (married to Nick Lachey) who was reported to be Photo courtesy of Jessica Pettyjohn“glowing.” Bettina Forbes, one of Best for Babes' founders, told me she personally made sure Vanessa received a copy of Breastfeeding Made Simple at the event. The photo on the left shows well-known environmental expert Danny Seo holding the book aloft.